Welcome to another Tablescape Thursday brought to you by our Hostess with the Mostest, Susan at Between Naps on the Porch! 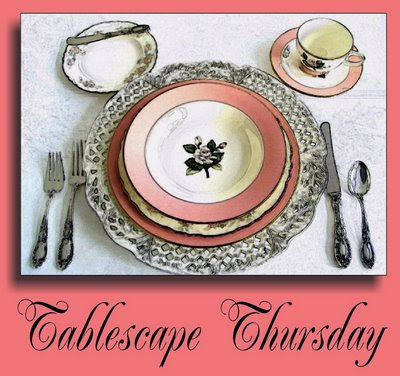 Be sure to drop by her blog to see another one of her beautiful tablescapes and to see the list of this week's participants! 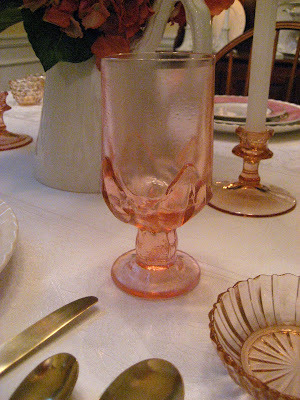 I'm calling this week's tablescape La Vie en Rose (Life through Rose-Colored Glasses). I am not normally a pink person, but the color is definitely growing on me...as you can see! This is actually my Easter tablescape, so I wanted it to have a Spring feel. We had a small family gathering that evening and, after a long day of 10,000 egg hunts and chocolate bunnies, I was bunnied and egged out, so they were banned from the table! Instead, I tried to keep it as simple as possible, using only pink, white and gold as the colors. 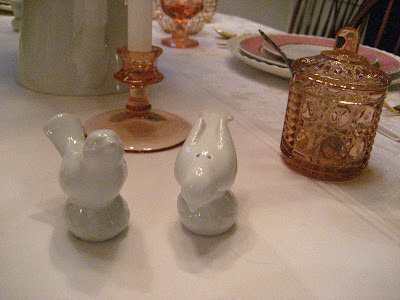 You will notice, however, that my Target birdies, Pierre and Marie, have returned from their jaunt in Hollywood, and were allowed...even welcomed...at the table! It appears that the glitz and glitter wore thin and they were ready to come back to work! I might add that they brought with them two new Hollywood friends, Humphrey and Lauren, who were the guests of honor at the opposite end of the table. Or is that Pierre and Marie at the opposite end? Hmmm...hard to tell. 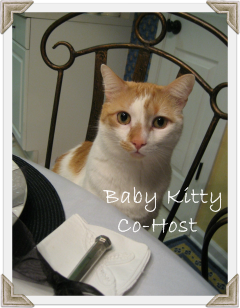 Baby Kitty is absent this evening...too many birds!! I am using my "gold" flatware from Target. My son-in-law asked me if he could take it to the gold exchange and trade it in for cash. lol The plates are from the clearance aisle at TJ Maxx and so are the chargers. Here's a close-up of the plates. I love the ruffles and bows around the rim! 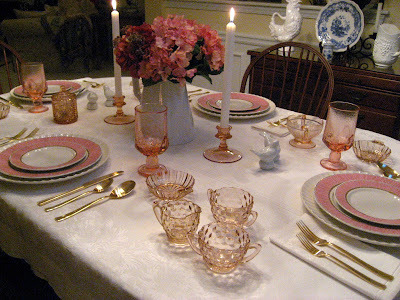 And.....once again, I'm using my pink depression glass as serving pieces. I even found little individual fruit dishes for each place! I like having a creamer and two sugars...one for my Splenda! I have shown you my lemon server before, but not without lemons on it. I love the delicate little etched pattern! Can you see it? I found these at a local flea market...Franciscan Cabaret iced tea goblets....four for $15!! I grabbed them and ran because the booth next door had the smaller wine glasses for $12 each! 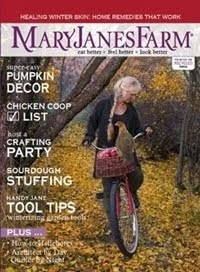 I was afraid that my lady would see that and bump up her prices!! I also found these pink candle holders for $6 for the pair. I don't know if they are depression glass, but I thought they were pretty and they match! 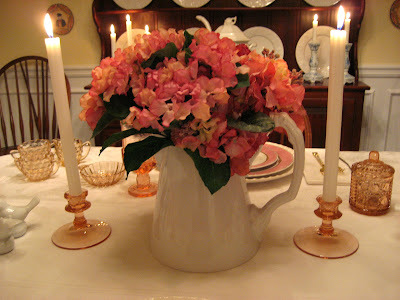 I used my bargain pitcher from the clearance aisle at Marshall's filled with hydrangeas as the centerpiece. I love the handle!! So there you have it...La Vie en Rose! Hey...I think I'm starting to like seeing things through my rose-colored glasses! I hope you enjoyed it! Please be sure to drop by Susan's to continue your tour de tablescapes! And I'll see you next time! Love your pink!!! What a beautiful springtime tablescape!!! 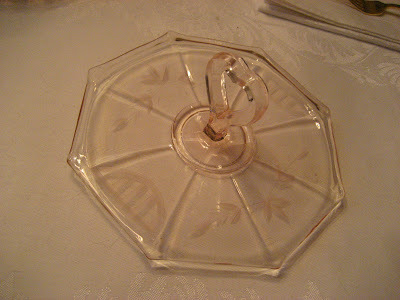 The depression glass is a favorite of mine. WELL DONE!!! I love love love this tablescape. I really want a set of pink dishes. They have been on my wishlist for awhile now. I love the way you pulled is together with so much grace and charm. It's so elegant and not over done. Just perfect my friend!! I love your pinks! So springy - glad your birdie babies are back--with friends too! I can't blame the little birdies for being so happy to be home from Hollywood! I would be happy to be home too! Debbie I think that pink is a great spring color and you've got another great table all set for whoever drops by. Cheers! 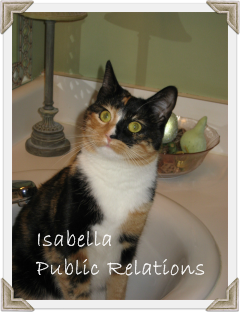 I think I love your blog best of all...you are a plate person like me, and you love cats too! I have to check in to see pictures of the them! Great Pink Table! Liz @ Casabella West! 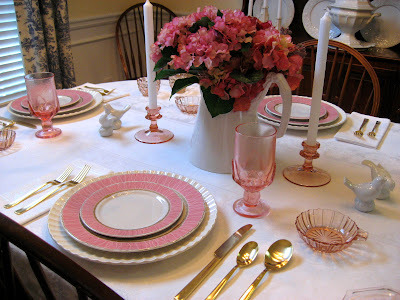 love the pink, its very pretty..thanks for sharing your tablescape with us! Hi! I'm not normally a "pink person" either, but when your post opened I literally went Ohhhhhhh! Pink is one of my all time favorite colors! Beautiful! 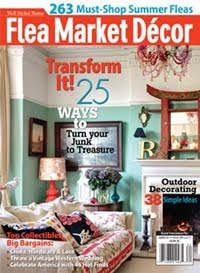 Oh, my heart skipped a beat over your pretty table! 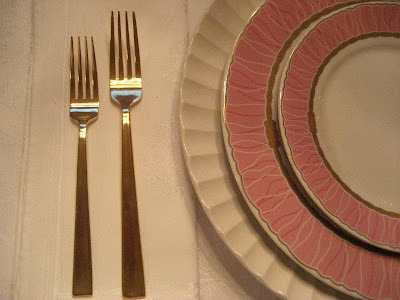 Love the pink...those plates are beautiful! I love how you paired it with the depression glass~everything is just perfect. A really lovely job! Wow! Pretty in Pink! I love depression glassware. As usual a lovely tablescape. 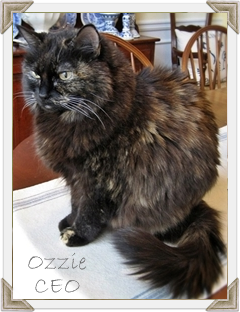 I'm sure I've told you this before but I love the pictures of your kitties! It's one of my favorites things about your site. Have a great rest of the week! What can I say? Your table is glowing! Very pretty in pink. What a beautiful china hutch you have. Debbie... I think this is the perfect pink tablescape... not too much... not too little.. and the pitcher of flowers... just simple elegance!! Pink always brings a smile to my face! I love your ruffled and ribbon plates, they are so pretty! Your pink glass is also lovely! Very elegant. Glad to see Pierre and Marie made it home safely. The pink is so pretty and spring-y. I love all the pink. It's so springy! Glad to see your Target birds made their way safely home. Mine did too! Love the pink and white table! Debbie, those plates are lovely! So is your entire table. Good job! The pink theme is gorgeous. I have a small lemon server too but mine is green. LOVE IT! Hi Debbie! 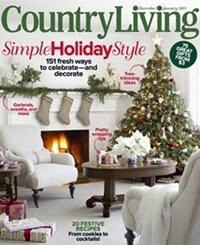 I really love the pink and white and all the old depression looking glass! So pretty. I probably say this everytime I come here cuz I'm old but I love your hutch with that plate rack top!! 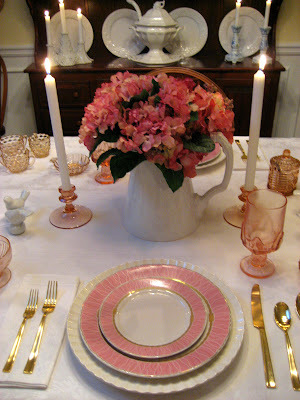 What a beautiful pink tablescape. I love it! 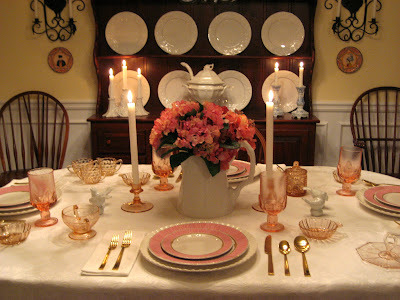 Such a lovely tablescape.....love your dishes and the impression glass, and your centerpiece as well. I'm so happy Pierre and Marie were able to make it back in time to help out with Easter dinner. Your pink tablescape is lovely. Oh,I do love those pink dishes! Lovely pinks for a Spring day! Lovin' your hydrangeas, too! Such a pretty table!!! 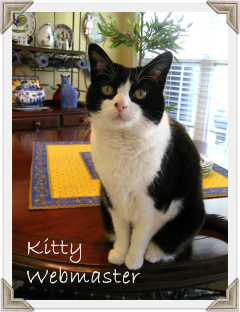 I LOVE your depression glass, and those dishes are wonderful! Good afternoon, Debbie Deb!! Your table is so beautiful! I love that you're becoming a pinkie! The dishes are just so pretty and those pink depression pieces - I need them! 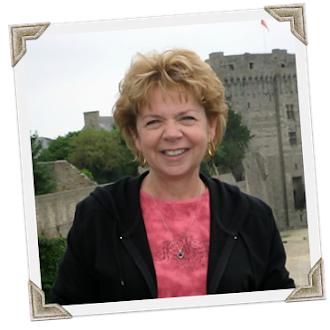 I'm so loving your new blog look! Debbie, the pink is so pretty! 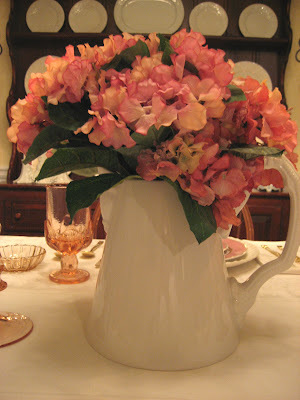 You are always an inspiration...your Marshall's pitcher is perfect as centerpiece and lovely filled with flowers. Everything glows! GORGEOUS! I just love the pink. Really quite beautiful! Beautiful, just love the simplicity of it. So elegant. How pretty, love the pink glasses! How lovely your pink table is! Berry bowls are great! What a great price you got on the semware. I do love the ruffles around your plates. The pitcher of flowers and candle stick just make it so lovely! I love the pink table scape. It is sooooooooo pretty! Your table is very pretty in pink!! Everytime I visit you I want something new!! Your pitcher is so pretty, I love the handle. The glasses are so different, I now want to hunt for some that are similar to them! This was just so, so beautiful! 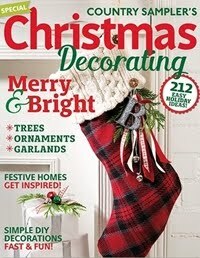 How I have enjoyed looking through your blog and sighing over all your treasures! Your Easter table setting is delightful...all your details create a lovely atmosphere for a meal. Simply lovely as usual! 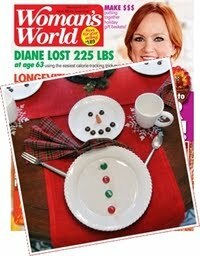 A great look for a wonderful Springtime tablescape. I love the goblets! I can see why you snatched them up! You sure do find some great and unique buys. I am always inspired by your posts! 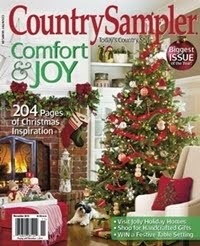 I left a little something for you on my blog...stop by and check it out when you get a chance!!! A table fit for the King of France! Lovely! I love your song choices! Love all the fresh Pinks for Spring. 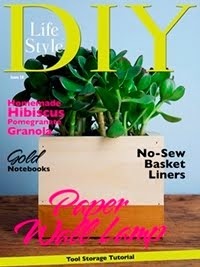 Your flower centerpiece is gorgeous as well. I see Pierre and Marie are happy to have their duties back. LOL! PS Your new blog dress looks amazing! Oh, my gosh. Those are the glasses I picked out when I married in 1975. They look great with your dishes, which are yummy. I'm so glad pink is winning you over! How you could not be won over by pink I can't understand! Lovely table...your glasses are so pretty...what a steal! I almost picked up those plates at TJ's...but they only had 3. Beautiful table! 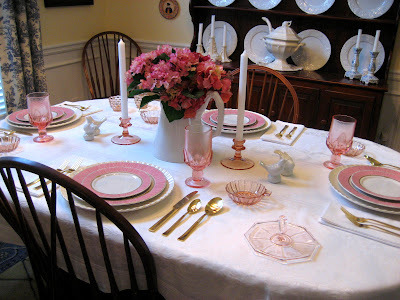 I recently posted a table scape using pink depression glass that has been in my family for 3 generations. I am sure your family felt very special! 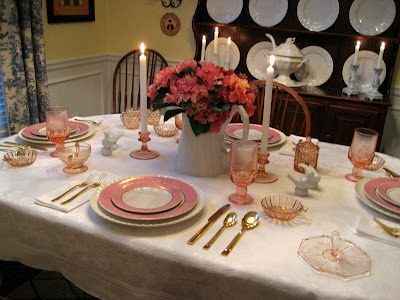 Miss Debbie~ This beautiful Tablescape would be a wonderful setting for a Mothers day brunch. I've been hunting high and low for rose colored dishes...to no avail. I found glasses but...my hubby was with me and you know how that goes. He thinks the few dozen we have already is enough, go figure. I haven't covered all colors yet, LOL!